THEME: Rome is capital of ancient history that has seen a great empire leave indelible trace of their past. Large factories still stand out, centuries later, animating the streets. They characterize the appearance, they draw a picture that even the passage of time was able to notch. In addition to being an open-air museum it is also known how to become the fifth value. Renowned directors have borrowed as a set for their films, not least the Italian Sorrentino of his “Great Beauty”. It is to these masterpieces that we want to pay homage, thinking of a space that becomes a container of images, scenes and costumes pertaining to these great masterpieces. An exhibition center a short walk from the Colosseum to allow many tourists enliven the capital to experience the story through the perception of endless cinematic art. Architecture becomes a messenger, a bridge between the eras, a sign of modernity in a city that never fails to enchant. …..Rome has always inspired scenes to film for the variety of places and situations that can offer suggestive. From the center to the periphery, the cinema has dedicated the importance of places known to history. Sercio, the new film museum, can not fail to consider the city as the real museum. The intention is to reveal new points of view and offer them to users in a dynamic manner. The wall becomes an element for projection, it contains films set in Rome and objects that have characterized the main scenes. As a director observes the hole of the camera, the visitor will have to push the right eye in the holes present on the surface of the wall to observe what happens in it. The project also wants to question its essence: the full identifies a building or a park? …..
……the Eternal City is a place to enjoy walking in the street. It ‘a situation in which a new architecture must take into account the existing city and its monuments serve as the scenic backdrop. 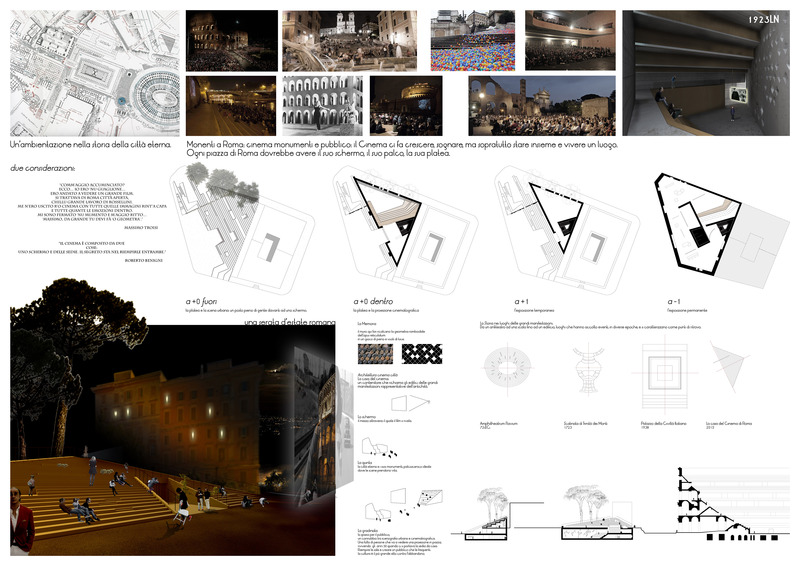 Proposing one of the models of the Roman Empire, the amphitheater, the proposal is defined around a scale of observation-audience film point where the scene is the city. The void is an essential part of this project, creates sharing. The spaces for the projections are two: one internal and underground, with another external gradonate that follow the unevenness of the ground. The materials used are concrete and bricks for the supporting parts, wood and marble finishes, clear references to the materials that characterized the Roman era architecture. 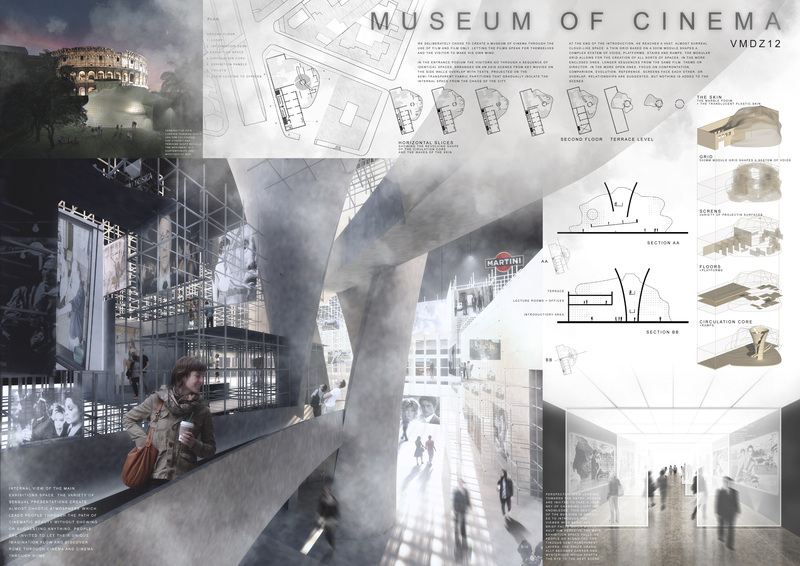 The project describes the film in terms of urban, architectural and social…..
…..the proposal builds on the idea of ​​the absence of the building, a sort of refusal to build in a place full of history and architecture. The Museum of Roman cinema is therefore a solid underground, trapped in circumscribed by the pre-existing wall brick. The shape preserves the morphology of the lot, which presents itself as a permanence of ancient tracks that served the area. 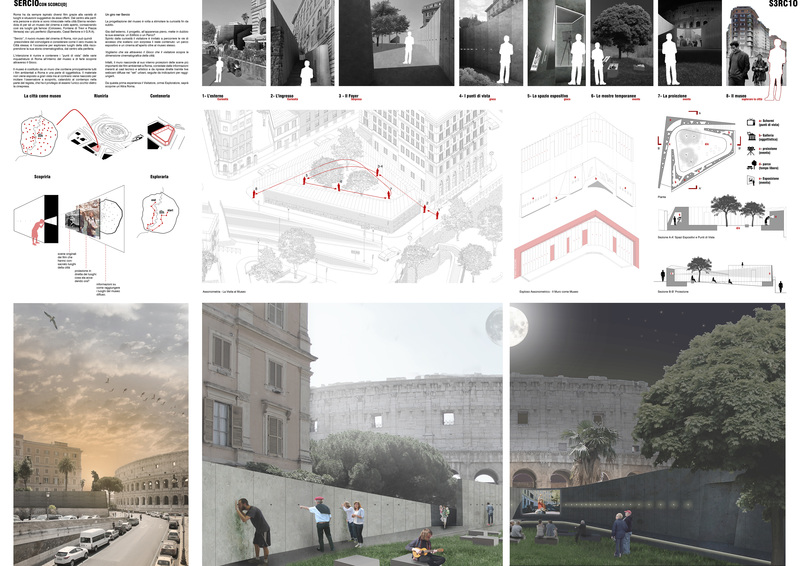 The museum development occurs in the subsoil, retaining an important visual relationship with the Colosseum and completing the ring of green that characterizes and delimits the archaeological area. 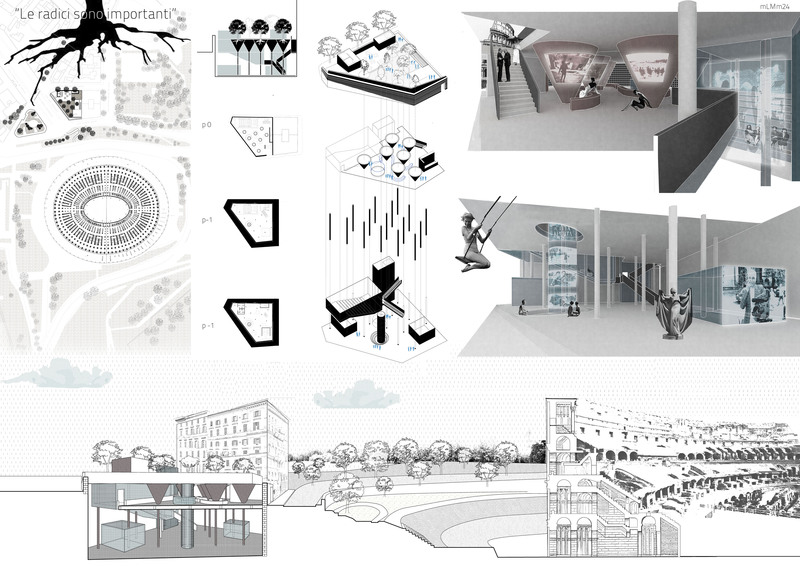 It seeks a dialogue with the historical roots, symbolized by the presence of numerous trees on the square outside. These are identified by the underlying elements in a conical shape used as surfaces useful to project images of the film masterpieces. The grid of pillars, in continuity with the vessels of the system, is the coordinate system within which handle spaces. 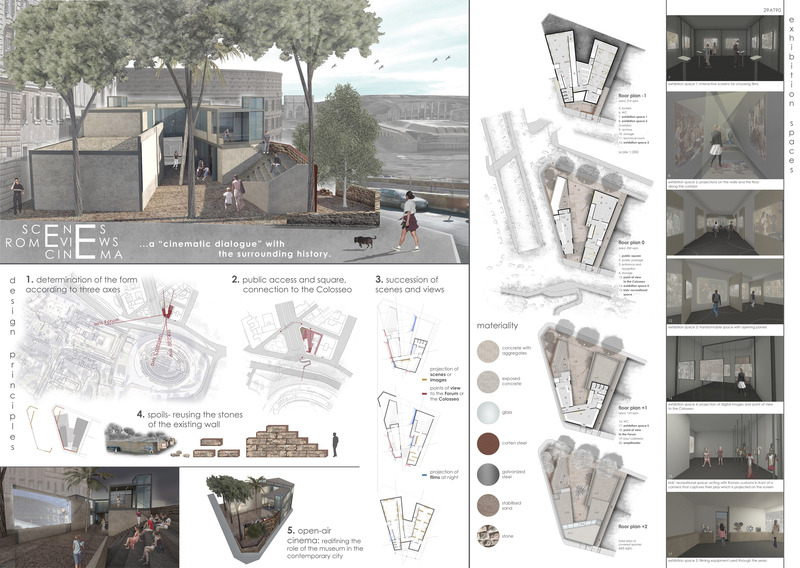 On this web of links between roots and subsoil, they are installed floating bodies, containers of additional services that implement the common rooms…..
…..designing in Rome means dealing with the history of this city. A story of overlays, integration and ongoing dialogue with the past. It means learning to recognize the value of the testimonies, treasure it in order to understand and express the present; learn to reuse and preserve rather than demolish and rebuild. Imagine a museum that tells Rome through the eyes of filmmakers is to recognize the artistic value of the film was that, since the forties, the art form is used to describe and document an era. From the first of these two premises comes the desire to maintain the wall that today surrounding the area of ​​intervention. From the historical cartography fact it is that the wall was already present in the ‘700; It becomes the base of the new architecture which overlaps without burdening on it. Light is an essential component of the project is dramatic in the rooms dedicated to Neorealist period, become more alive in the rooms dedicated to the cinema of the 70s. 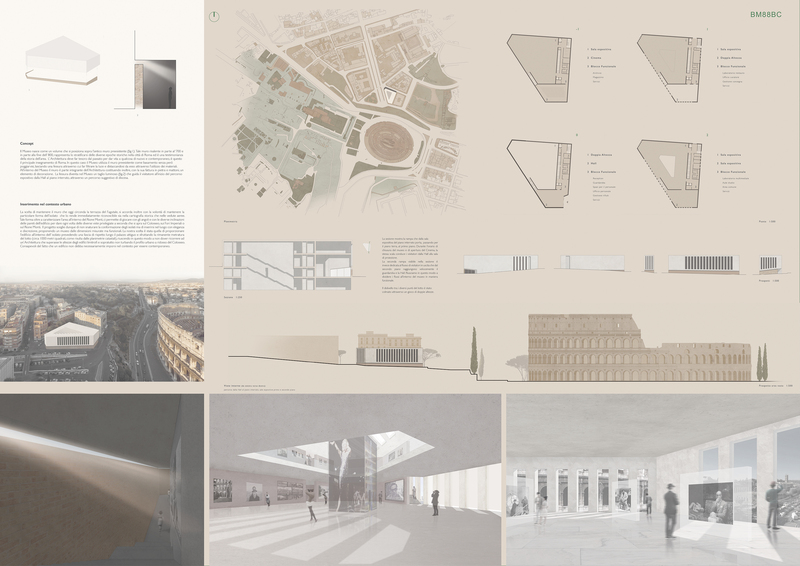 The external volume has a simple design, characterized by regular cuts on the surface of the cover and one of the four sides of the building…..
…..the layers in this city are numerous. He had to create something capable of guiding the visitor less experienced but that return a satisfying experience for even the most educated viewer. The podium entrance, with its minimalist appearance, plays a key role. Guests pass through a sequence of ordered spaces arranged on a single axis; movie scenes are projected on the side walls, gradually isolating the interior from the busy city. After passing the entrance you reach a surreal space. A subtle grid based on a form fifty centimeters modeling a complex system of empty, platforms, stairs and ramps, where you are free to roam in areas with different functions. In those more closed the visitor is confronted with the sequences of the film, while in the open ones are proposed occasions of encounter and interaction. 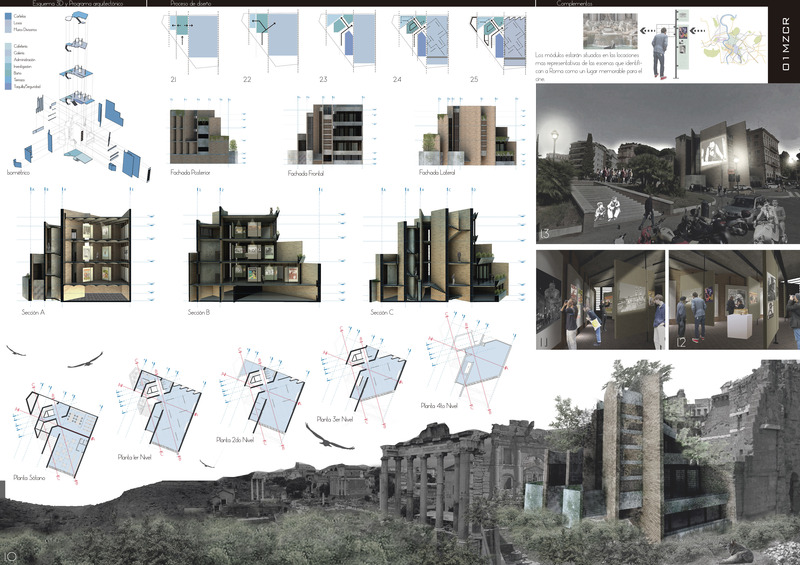 Are the relations between context and content of the idea behind the project…..